Who would have ever thought that something as simple and non-doing as mindfulness meditation could be the key to losing weight and keeping the pounds off. Apart from mindfulness eating, which helps prevent over eating and makes you more aware of when you are full, there are a number of scientific studies now alluding to the multitude of benefits of meditation for the mind and body. Before we look at what mindful eating is, let’s look at what it isn’t. If you’ve ever found yourself eating food while doing something else like say watching the TV, reading a book, working on your computer, using your mobile device, talking to others, or pretty much anything that distracts you from the act of eating and enjoying the food, then that’s not mindful eating. In fact, the way we eat our food determines how it gets digested. So if we eat in a hurry, or while we are feeling rushed, irritated, upset, or distracted, then this is how our food is received into our bodies digestive system. Typically when this happens we don’t chew our food properly and we are not in tune with how our body is receiving the food. This means that our food can become harder to digest and that we’ve probably eaten things that are not necessarily what our body needs to perform at peak levels of energy and vitality. As this unconscious behavior continues we start to gain weight and wonder why. Then add in on-going stress in your life and no real ways to cope with it and you have a recipe for poor health in the making. That’s why mindful eating is so profound. It’s all about the simple act of paying attention to what you put into your body, even before you take your first bite. Think of it almost as a way to let your body know that you actually care about it enough to slow down and enjoy giving it nourishment. Eating mindfully changes the relationship between our mind and the way we think about food or drink. It helps us to pay attention to what we are doing so that we listen to our bodies signals and honor it by being aware of what is happening from moment-to-moment while eating. Take a moment before you even begin eating to think about where the food you are about to eat came from. It had a life too once and it has come from a farm or in the ground where it was tended to until it was ready to be used as food. It may have passed through many hands just to get to your table. Thinking about this gives appreciation for what you are about to eat. Take in the color, aroma and texture of the food in front of you before you take your first bite. Really notice the food using all your senses and get an appreciation for what it is you’re about to eat. When you take your first bite be aware of the flavor, texture and even listen to yourself chewing as this helps you to stay present while eating. Make sure to take one bite at a time and then wait a few seconds between each bite so that your focus stays relaxed and present with your food. It’s also a good idea to put down any eating utensils between each bite so you can stay focused while eating. To help stay present while chewing you can count each bit. I always aim to chew up to 40 times with each mouthful as this helps to maximize digestion of the food and also helps prevent rushing through bites. Eat smaller portions. You’ll find that’ll you’ll want to eat less just by cutting your food into smaller pieces and then taking the time to be present while eating. Not only does this help you to feel fuller faster, it also helps reduce over-eating. When you have finished your meal, sit silently for a moment and be present with your body to notice what the action of eating mindfully has allowed for you. This is not an exercise in judging how your body feels, it’s simply to notice what’s happening in the moment. This also helps to finish your meal in a relaxed manner. 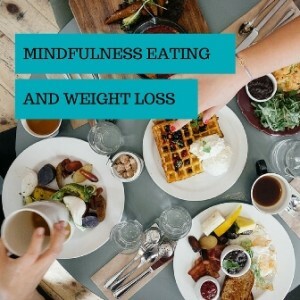 Mindful eating is not only a healthy and fun way to lose weight and keep the weight from piling on, it’s also a great way to honor your body and be more present and focused in your everyday life. Never confuse slowing down with wasting time. Think of it more as enjoying a richer and fuller experience of how you choose to use your time. Take your time while you eat and the benefits will speak for themselves.